Figure 1. The global DIVA coastline for Croatia (grey) and the much more detailed coastline we developed for this project (green). GCF is supporting the project through the development of very detailed regional coastal information. 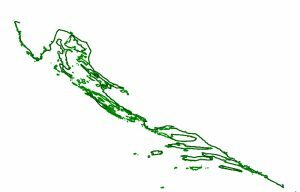 We use GIS software to produce high-resolution coastal data of two participating countries: Croatia (see Figure 1) and Tunisia. While in the global coastline of DIVA Croatia is represented by 30 segments the new coastline contains about 1.500 segments. 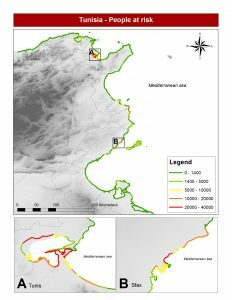 Detailed digital elevation data is connected with local infrastructure data to provide high resolution results about future coastal impacts such as anual people affected by floods, expected anual flood damages, and effects of erosion. The project is funded by the United Nations Environment Programme (UNEP) under the GEF PROJECT ID 3990. Figure 2. The city of Split (Croatia). The blue shaded areas are below 1m above mean sea level. Due to the different coastal morphology of the two countries in the study there are different effects. The rocky coast with pebble pocket beaches in Croatia is mostly unerodible, so erosion is not a big problem. Otherwise there are significant low lying areas in the urban regions (see Figure 2) which are exposed to rising sea level and to higher flood events. Furthermore large parts of the coast are covered with buildings, many of them used as second homes or for tourism. This fact makes complete protection difficult and expensive. In Tunesia we found a different situation. Sandy beaches are more frequent than in Croatia, so erosion is an issue here. Buildings and infrastructure are concentrated on a few urban regions including Tunis and Sfax. Therefore the length of the coastline that has to be protected is limited and protection cost is bearable. Figure 3. Expected number of people flooded in 2100 in Tunisia under a high sea level rise scenario and a high population growth scenario.